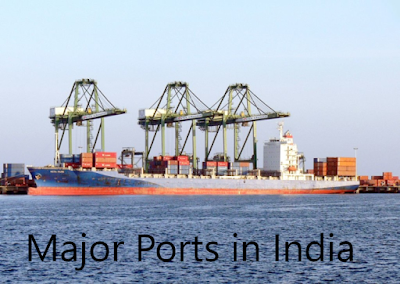 What Are the Major Ports in India? India being surrounded mostly by water in its southern regions has one of the largest peninsulas in the world. It spans about 7516.6 kilometres of coastline. As per the reports of Ministry of Shipping, 70% of India’s trading by value and 95% by volume is carried out through maritime transport. We have 12 major ports in India, besides 200 other ports. Below are 12 major ports, dotting the lower parts of the country. 1. Kandla Port: Also known as Deendayal Port and Kandla Port, it is located in Kutch District, Gujarat. It was Constructed in the 1950s as the chief port for western India. In the FY 2016-17, it handled cargo of 105.44 million tonnes which makes it the busiest major port of India. This port mainly handles crude oil imports. However, it is also looking forward to handling non-POL cargo. 2. Paradip Port: Paradip port is a deep-water and natural port located in Jagatsinghpur district, Odisha. In the FY 2017-18, it carried out the dealing of cargo weighing 102.01 million tonnes. This port is administered by the government-owned Paradip Port Trust (PPT). 3. Jawaharlal Nehru Port (JNPT): Located in Navi Mumbai, Maharashtra, this is country’s largest container port. In the FY 2016-17, it handled 62.15 million tonnes of cargo. Most of its cargo traffic comes from states like Karnataka, Gujarat, Madhya Pradesh, and Maharashtra. It carries out the export of carpets, boneless meat, sporting goods, pharmaceuticals, chemicals, textile machinery, and textiles. Major imports include vegetable oils, electrical machinery, plastics, machinery, chemicals, a few non-ferrous metals, like aluminium and more. 4. Mumbai Port Trust: This port lies on the country’s west coast in Maharashtra. It is administered by the government-owned Mumbai Port Trust (MbPT). Mostly used for bulk goods, it handled 63.05 million tonnes of cargo in the FY 2016-17. It primarily handles petroleum products and Crude, in addition to, liquid chemicals. 5. Visakhapatnam: This is the only major port located in Andhra Pradesh. In the FY 2016-17, it carried out cargo handling of 61.02 million tonnes. Opened in December 1933, it is owned by Ministry of Shipping, Government of India. It mainly handles commodities such as crude oil, coal, general cargo, steel products, manganese ore, and iron ore.
6. Port of Kolkata: Established in 1870, this port is the oldest in India. British East India Company constructed it to have it as a premier port in British India. In the FY 2016-17, it handled 50.95 million tonnes of cargo. It deals with petroleum products, fertilisers, coal, granite, and iron ore.
7. Chennai Port: Opened in 1881, this port is also one of the oldest ones in India. For the FY 2016-17, it handled 50.21 million tonnes of cargo. It mainly handles commodities like petroleum products, fertilisers, coal, granite, and iron ore. Its major exports are cotton textiles, leather, and iron ore. The major imports include iron & steel, machinery, raw cotton, and wheat. 8. New Mangalore Port: This port is an all-weather, deep-water port located in Mangaluru, Karnataka. Opened in 1974, this one is operated by New Mangaluru Port Trust (NMPT). It handled 39.95 million tonnes of cargo in the FY 2016-17. The major exports of this port are cashew, coffee, granite stones, manganese, iron ore fines, iron ore concentrates, and pellets. Major imports include finished fertilisers, timber logs, wood pulp, LPG, crude, petroleum products and liquid chemicals like phosphoric acid, liquid ammonia, etc. 9. Tuticorin Port Trust: This weather port is also known as V.O.Chidambaranar Port. It is located in Thoothukudi, Tamil Nadu. It handled 38.46 million tonnes of cargo in FY 2016-17. It mainly deals with commodities like iron ore, timber logs, fertiliser, copper concentrate, and industrial coal. The major exports are limonite ore, granite, sugar, liquid cargoes, building materials, and general cargo. The major imports are edible oils, petroleum coke, petroleum products, rock phosphate, raw fertiliser materials, fertilisers, cement, and coal. 10. Ennore Port: Also known as Kamarajar Port, this is located on the Coromandel Coast, Chennai. Opened in 2001, it is the first Indian port which comes under the public sector. It handled 30.02 million tonnes of cargo in the FY 2016-17. It handles rock mineral products, chemical, POL, LPG, project cargo, automobiles, and thermal coal. 11. Cochin Port: Also known as Kochi Port, it has completed 91 years being in operation. It is located in Kochi city on the sea-route of Arabian Sea – Laccadive Sea – Indian Ocean. In the FY 2016-17, it handled cargo of 25.01 million tonnes. This is also one of the largest ports in India. It is operated by government-established Cochin Port Trust (CPT). 12. Mormugao Port Trust: Lying on the western coast of India, this port is located in Goa. It handled 33.18 million tonnes of cargo in the FY 2016-17. Besides being a leading port for exporting iron ore, it is also a major exporter of pharmaceutical products, pig iron, iron casting, liquor, and frozen fish. Its main imports are steel turning, potassium carbonate, shredded scrap, and heavy melting scrap.